A very variable progressive band from the Düsseldorf region, with a sketchy history, not least in that on the title track of NORDLAND (which is reputed to be their debut) the lyrics refer to it as being "the B-side of our second album", yet although they are reputedly formed in 1969 no earlier album is known. An early concert review describes them as being "eine Mischung aus barocken Orgelschnörkeln und coolen Jazzspielereien" which is quite different to the sound on their debut album. In 1975 Streetmark were fronted by gruff aspiring Heavy Metal vocalist Georg Buschmann, who tended to get in the way somewhat, in what was a complex keyboard progressive with unique rhythmic structures. NORDLAND was a fine, if very varied album (odd for the inclusion of a Beatles number), with many excellent instrumental excursions, diverting to classical rock and spacey prog. After Buschmann left (he went on to Straight Shooter), they were then joined by vocalist/synthesist Wolfgang Riechmann on EILEEN. His background in electronic music (with the seminal but undocumented Spirit Of Sound) changed the Streetmark style dramatically, moving to a spacey synth-drenched progressive, with lengthy surging instrumentals. A fresh and innovative album with a style of its own, which they were unable to follow afterwards without Riechmann. 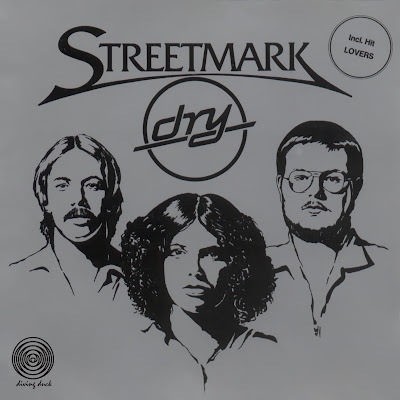 On DRY Streetmark were down to a trio, with Dorothea Raukes in control as multi-synthesizer/keyboard operator and vocalist. A nice, but more commercial offering, with good use of male and female vocal harmonies. Highly synthesized, yet mellow, almost dodgily sounding like The Carpenters on one track, it also hinted at the more commercial style SKY RACER was to follow.